The Wrong Shoes, Are You Wearing Them? What are the Best Shoes? The Wrong Shoes, Are You Wearing Them? The wrong shoes can cause hip pain, knee pain or back pain. Knowing how shoes affect your body can help you choose the best shoes when shoe shopping, especially, if you already suffer with joint or muscle pain. This picture is an example of a great supporting sandal with shock absorption. Wearing the right shoes can significantly help relieve hip pain, knee pain, heel pain, foot pain, back pain and muscle stress and pain. Our Feet Are The Foundation Of Our Body..!! And, what we put on them can significantly change the structure of our alignment, which causes pain and stress on the body. Wearing the wrong shoes subjects the muscles and joints to stress, causing pain, joint deterioration and fatigue to the body. What Are The Wrong Shoes? Shoe styles in this category do not attach securely to the foot, such as sandals and thongs/flip flops or any shoe that does not have a band across the top of the foot arch or a strap around the heal allowing the shoe to flop and your toes to crunch up to hold on the shoe. The constant crunching of the toes doesn’t allow the foot arch to flex normally or the foot to push off correctly and this action causes the hips and knees to absorb the impacting shock of your steps, causing joint pain. Because the hips and knees are more engaged when wearing this type of shoe, the back of your legs and your back muscles do not help support this stride, as they should. Flip flop shoe styles don’t provide any arch support aggravating and causing inflammation of the plantar fascia, a band of tissue on the bottom of the foot that runs from the heel to the toes. Flip Flop Style Shoes Are The Wrong Shoe Type, If You Need Help Alleviating Knee, Back and Hip Pain. Wearing these types of shoes puts constraint on the movement of the plantar fascia and creates stress on the knees, hips and the back. Many flat shoes do not have support and without support to the arch, the plantar fascia can overstretch and over time cause the arch to collapse. The picture above is an example of a great arch supporting shoe. Flat Shoes Could Be Considered The Enemy To The Foot Arch! Flat shoes also lack padding which can cause pain in the heel or ball of your foot, especially, if you have high arches. Unless, they have great arch support, padding and shock absorption like the picture to the left. Flats create 25% more shocking impact on the heel and this shock reverberates through the rest of the body, causing stress on the joints and muscles, creating wear and tear;damage to the joints. This constant shocking impact can cause pain and deterioration in the hips, back and knees. What About The Popular Toning Shoes? Toning shoes have become big business, but the action of the soles prevents the foot arch from naturally flexing. Eventually, this can cause flattening of the arches and lead to over pronation, where the foot or feet roll inward. This causes the lower leg to turn inwards which puts the knee and hip out of alignment and can cause the back to be rotated. Your feet absorb less shock causing hip pain, knee pain and back pain. Toning Shoes Should Be Worn Carefully or Avoided. In fact, The Consumer Product Safety Commission's Web site has so many complaints about injuries from this type of shoe that Reebok recently agreed to reimburse over $25 million to consumer for overstating the benefits of its toning shoes. High heels disrupt the alignment of your body and this unnatural foot position changes the center of gravity putting pressure on the ball of the foot causing extra stress and strain on the lower back. This unnatural gravity pull, on the body, makes you walk with your knees slightly bent and this puts tremendous stress on the knees, not only causing knee pain, but deterioration of the cartilage. Wearing high heals as your everyday shoe can also lead to hammertoe, shin splints and shortened calf muscles. High heels over 2 inches are the worst of the wrong shoes to wear. All of the above shoes can actually help create the pain and deterioration of the joints, instead of, relieving hip pain, knee pain and back pain.Trying to relieve your pain while wearing the wrong shoes, only makes matters worse. So, What Are The Best Shoes? 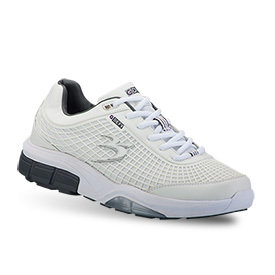 Sneakers Or Any Shoe With A Rigid Heel Counter And A Rigid Mid Sole Provide The Best Support. Also, shoes with laces typically provide better support than loafers or shoes with Velcro straps. Shock absorption is also very important, because the shoe absorbs most of the shock, transmitting less shock to the entire lower extremity, including the back. So, sneakers are the winners for the best shoe support for walking, running, exercising and everyday wear activities. And, they are the best shock absorbing shoes for men and women to help relieve back pain, hip pain, knee pain and muscle strains. The wrong shoes can promote the aging process to the muscles and joints, simply because the extra stress and shock create wear and tear causing deterioration, knee pain, back pain and hip pain not to mention inflammation, which is pretty critical if you suffer with Rheumatoid Arthritis.